Vade ad victors spoila. To the victors the spoils. The final round of a long season with all four Championships finely balanced. A two horse race for the Elite crown between the two flying Yorkshiremen, reigning Champion Joe Holmes and Rob Newman with Holmes twelve points ahead. 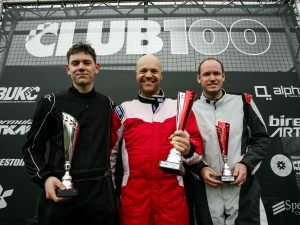 In the Clubman’s, five time A Final winner James Taylor against Stefan Scully who had yet to win a race but arrived at Buckmore with an eleven point advantage. In the lights Mike Noon leading the way from Chris Woodger by just eight points. And finally the Heavyweights with the oldest winner in Club 100 Sprints level on points with the youngest winner Seb Algieri. Here’s how a dramatic day unfolded. 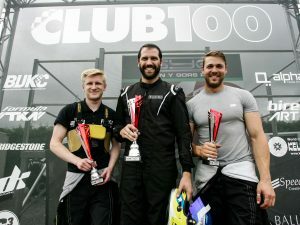 James Taylor had been praying for rain all week knowing that that inclement weather would give his chances of closing the gap to Championship leader Stefan Scully a huge boost. His prayers came true as the rain began to hammer down before the start. It abated as the grid formed up but Buckmore Park isn’t a track that dries out quickly. 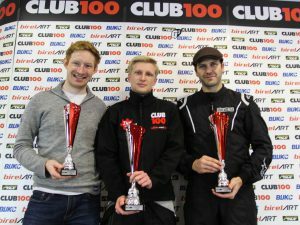 Steven Downes sat on pole with Christopher Powell alongside. Taylor and Liam Cochrane shared row two with Andrew Dawson and Jon Watkins on three. 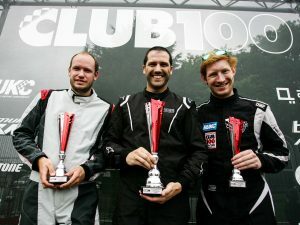 Row four saw Championship leader Scully alongside David Whitehouse whilst James Martin and Stephen Westwood completed the top ten. 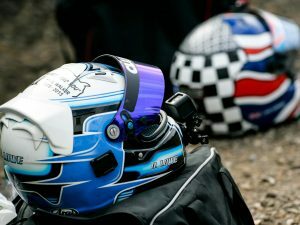 Simon Lloyd and Stuart Osborn shared row six with a returning Tyler Mays alongside Darrell Lowe on seven and Mark Ridout all on his own at the back of what was a disappointingly small grid. Downes led away from the line but almost immediately found himself in trouble as he tagged Powell who spun to a halt. Taylor made the most of the confusion to move to the head of the pack with Dawson slotting into second. By the end of the lap Taylor would be almost two and a half seconds clear. Martin drove a phenomenal first lap moving from ninth to third on the greasy surface with Cochrane keeping himself out of trouble in fourth as he explored the grip levels. Downes ran fifth but his race would be a practice run as he would suffer the inevitable post race exclusion after his collision with Powell. Watkins was next with Scully right behind from Lloyd, Whitehouse and Mays. Taylor continued to pull away at the front from the rest of the pack, still headed by Dawson but now over four seconds adrift of the leader. Cochrane and Watkins both began to put pressure on Martin for third. Cochrane was first to get by with Watkins following a few corners later. A lap later and Cochrane was up to second but trailing the leader by over five seconds whilst Watkins was stuck behind Dawson. 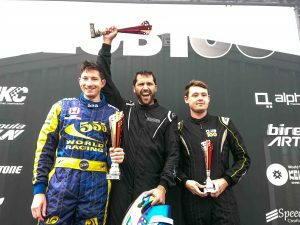 Cochrane set the fastest lap of the race on the penultimate lap but Taylor took the win still over four seconds clear of Cochrane with Watkins third a further four seconds adrift of Cochrane with Dawson fourth just a couple of kart lengths back. Championship leader Scully had endured an awful race lapping well off the pace of the front runners. He’d run seventh early on but gradually fell away to finish thirteenth. The pendulum of fate had swung towards Taylor. Pole for Martin with Westwood alongside. Lloyd and Osborn shared row two with Mays and Lowe on row three. Ridout and Downes had drawn row four with Powell and Taylor completing the first five rows. Scully was back in fourteenth. Martin led the field away from the line but Westwood, Lloyd and Osborn all lost out badly through the first turns and it was Mays who led the field across the line at the end of the first lap pursued by Martin and a fast starting Ridout. Lowe ran fourth ahead of Westwood and Lloyd who over the course of the next couple of laps continued to fall back. Cochrane was on the move rising up from grid eleven whilst Scully was also moving up the order after his disastrous first heat. Taylor was a first lap spinner resuming last and giving him a mountain to climb, as the advantage swung back towards Scully. Mays continued to set the pace at front running one and a half seconds ahead of Martin who had Cochrane closing him down. These two were well clear of the battle for fourth headed by Dawson from Lowe, Scully and Ridout. Taylor was back in thirteenth. The order amongst the front runners remained static with Mays holding a comfortable lead. Cochrane however was closing in on Martin and took the place with three laps to go. Mays however controlled the pace superbly and crossed the line for a deserved win with Cochrane second and setting fastest lap. Martin retained third from Dawson, Lowe and Scully but behind these things got a little fraught over the final laps as Taylor closed in. Whitehouse took seventh after a really strong drive up from grid fifteen. He kept clear of trouble and made some incisive moves as he moved up the order. Scully was just too far ahead at the flag for him to catch whilst eighth went to Taylor who was flying by the end of the race in what had become a damage limitation run after his early spin. The pendulum though had swung back towards Scully. Whitehouse on pole for the final heat with Ridout alongside. Scully and Lowe on row two with Watkins and May sharing row three. Dawson and Osborn on four with Cochrane and Lloyd sharing row five. Taylor would start eleventh. Whitehouse led the field away on the still damp track but Ridout lost out to Scully. Lowe, Mays, and Dawson all fell back whilst Cochrane rocketed up to third. Taylor too got a great start moving up to sixth. Whitehouse was looking comfortable at the front leading by almost three seconds from Scully. He increased the lead over the second lap as Scully defended from Cochrane. Further back Taylor had slipped back to eighth as the field crossed the line at the end of the second lap. Whitehouse continued to pull clear and after three laps was almost five seconds up the road from Cochrane. Scully remained third with Watkins just a couple of tenths back in fourth. Ridout was next just over a second clear of the recovering Taylor in sixth. Once clear of Scully, Cochrane immediately set about cutting the gap to Whitehouse but down the order we had major drama as Taylor tried to put a move on Ridout at the pit exit bend. The lowest point on the circuit and a low point for Taylor as he spun to a halt, his Championship hopes seemingly in tatters. Whitehouse continued to lead but Cochrane was eating into his lead by a second a lap. Scully remained third from Ridout but clear enough for the latter not to be too much of a threat. 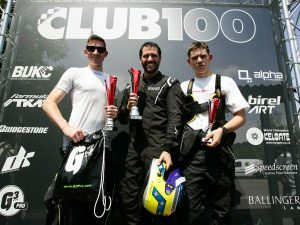 With one to go Whitehouse looked to be safe at the front but Cochrane put in a supreme effort, setting the fastest lap of the race and cutting the gap to just under three tenths. But it was a great win for Whitehouse. 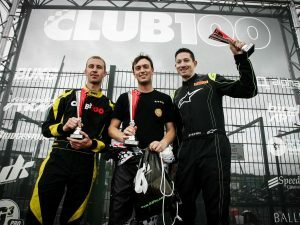 Scully came home third and with Taylor back in thirteenth he had one hand and a few fingers on the Championship crown. Ridout took fourth ahead of Dawson. Cochrane on pole from Dawson with Whitehouse and Mays sharing row two. Ridout and Watkins on three with the fourth row occupied by the two Championship protagonists, Taylor and Scully, with Scully only needing to finish in the top nine even if Taylor won to take the crown. Martin and Lowe shared the fifth row. Cochrane led the field away and this time everyone remained on track as a dry line had finally begun to appear. Over the line at the end of the first lap and Cochrane was over a second clear of second placed Taylor who had driven a quite brilliant first lap to move up from grid seven. Dawson was third with Whitehouse fourth from Mays. Scully was eighth. Two laps in and Taylor had cut the gap to the leader to just a couple of tenths courtesy of Cochrane spinning through three hundred and sixty degrees at the bottom of the hill. Luck boy to have ended up facing the right way and a following Taylor must surely have thought that Lady Luck was again deserting him. Thereafter Cochrane began to pull clear whilst Taylor was in turn moving clear of third placed Dawson. Scully meanwhile was also moving up the order. By half distance he was up to sixth and just a couple of tenths behind Mays. With four to go he was into fifth and with both hands save for one finger on the Championship trophy. I watched him come down the hill and then I glanced away only to hear that horrible slithering noise denoting a spinning kart. And there was Scully, parked. He would later say that he’d simply been caught out by the drying track and gone from wet to dry to damp in the space of a few yards. A cruel, cruel blow. He would resume last. 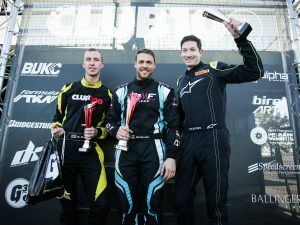 Cochrane took the win over four seconds clear of a jubilant Taylor with Dawson taking the final podium spot and Whitehouse setting the fastest lap. Mays took fifth. A great result on his comeback with Ridout sixth from Watkins. Powell, Lloyd and Martin completed the top ten. 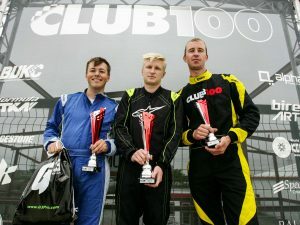 James Taylor finally took the Clubman’s honours by just four points. Well deserved but if ever there was a Championship that proves the sporting adage that luck evens itself out over a season then the Clubman’s is it. Five wins from his first five starts out of the first seven rounds left the rest of the field trailing in his wake. And then form deserted him as did good fortune and Stefan Scully began to close in by virtue of a consistent run of results. He was fortunate at Clay not to get a penalty which would have meant exclusion but he was the overwhelming favourite at the last round. There is no need to dwell on why he lost it but he should be very proud of his efforts this year. Second in the Championship is a great result. 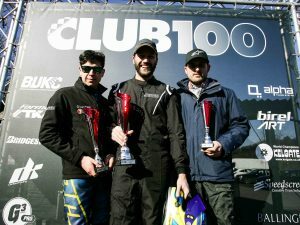 Jon Watkins took third in the standings and had the satisfaction of a win at Rye. A good season. So too for Mark Ridout. He took some time to really get going but once he did he was always a factor. 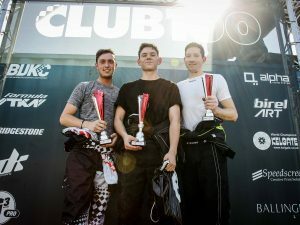 Two podiums in his last four races showed his undoubted talent. Fifth in the standings went to Darrell Lowe. He took two wins in the season but lacked consistency. Only he can unlock what I think is a great talent. And finally, one can only wonder where Liam Cochrane would have ended up had he done the full season. A missed opportunity Liam?